9 Where’s My Cell Phone? Planning a “couples’ night” party for your favorite friends? There is more to do than movies and popcorn; and don’t expect your favorite playlist of songs will keep the party hopping all night long, not everyone loves Fleetwood Mac like you do. Get out some of these great games to play with friends and keep everyone smiling and interacting! Here comes the first fun game to play with friends: Mr. Postman. Similar to musical chairs, this game is a great icebreaker and provides a chance to get to know each other. Set up a circle of chairs with room for everyone to stand and move. The Postman in the middle calls, “Delivery! Everyone who has a pet!” Whoever has a pet gets up and exchange seats with another one, giving the Postman a chance to grab a chair. Change delivery topic to anything you like! 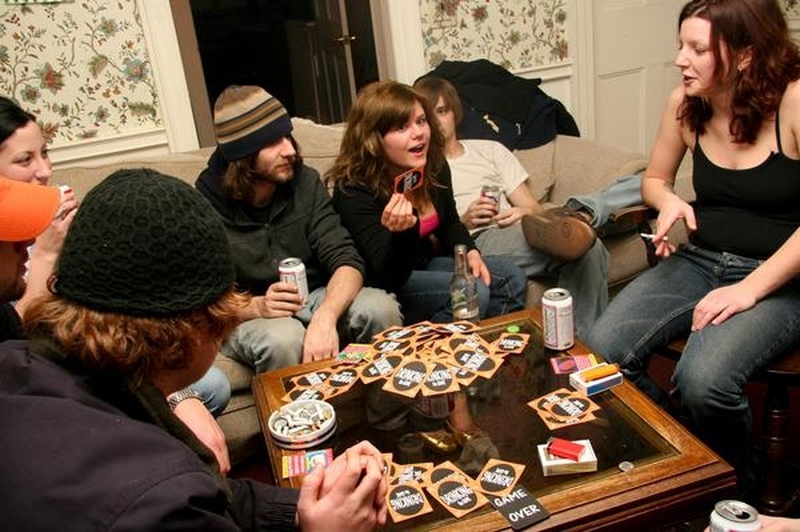 This is a very popular game to play with friends for a theme party, everyone will be involved from step one, and if you have an artistic side, you have an advantage. Divide the players into 2 teams. Everyone from each team writes a theme related catch phrase on a piece of paper, and each person will have a chance to pick a phrase and attempt to draw it while the other team guesses. Use a timer for timed drawing and timed guessing. This is a belly buster that is interactive and hilarious because everyone loves winning! Form a circle, sitting on the floor and cross arms with hands flat on the floor. Go around the circle, patting each hand once, and there could be a double pat switch direction. If someone accidentally pats or raises their hand to pat and it’s not their turn, that hand is out. Last hand in wins! As our 4th game to play with friends, this will get you thinking and wondering about your friends. Use three cards, two say “Honest,” one says “Not,” put them in front of three people with no one peeking. According to their card, they have to answer a question honestly or not. Everyone else works on figuring out who is not honest. If you are caught, you do a dare; if not caught, you choose who does the dare. A classic that sees which team is the sneakiest! Two teams split an area equally (best played outside), each team has a flag to hide with at least an inch of the flag must be visible. Sneak over to capture the flag; if you are captured, go to “JAIL!” A member of your team may save you, but he or she can still be tagged when trying to make it to your own side. The first team sneaks the flag wins. Find out who know what about current pop culture! Find as many fun questions about music, movies, TV, celebs, etc. Set up two to four teams to answer questions and receive their points when correct. You can use bells for buzzers. This game can be turned into your favorite TV game show with a little extra organization. When it comes to the games to play with friends, who can forget the forever classic Scavenger hunts? Scavenger hunts bring out the competitive side to everyone, and it will show who is really creative. Each team gets a bag that is the same size. Set a time limit for each team to find something that starts with a letter, like starting with “A.” When the buzzer rings, the team with the most items wins! Items cannot be used for multiple letters, for instance, remote is C (controller) or R (remote). No more lame kissing in the closest when the bottle lands on you, see what dares your friends are willing to do. Have a bowl filled with dares written by everyone at the party. If the spinning bottle lands on you, you pick your own dare. If you are in the game, there is no getting out of the dare, just do it! Chasing each other in the dark is always fun! This game is only played in the dark. One person gets a cell phone and hides, everyone else works together to find him. The group is allowed one phone. The person hiding is allowed to change hiding places but must call the group to give short hints and clues to their location. Now, try to find your phone! The last but not the least, Speed Racer occupies the final place of our "Games to Play with Friends." If it’s time for the party to wrap up, this is great for those who linger—a challenge and lack of breath will tire them out! Set up a table with two racing tracks (double sided sticky tape). Place a ping-pong ball on each track and see who can get their ball to the end first, the hard part being you can only use a straw. Don’t get dizzy! Have a friend that understands the rules and atmosphere of your party as backup since you may get distracted. Always stand where everyone can see you and keep the attention of the group. Play games that have easy props or none (no running to the store), if there is something missing, improvise! Be sure to be clear on the rules and plan ahead. This will help keep everyone interacting and the games will smoothly run together. If the interest of the group is lost, don’t play. Be sure your teams are evenly set up and feel free to change the rules as needed. Have fun!